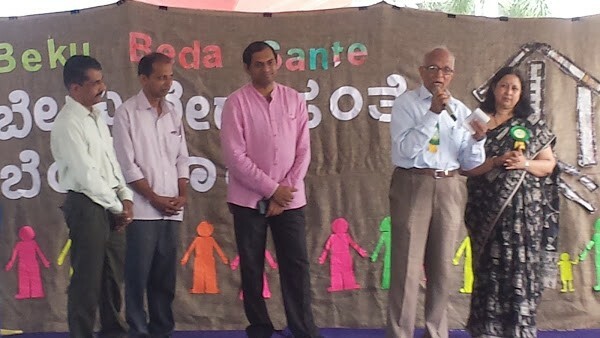 Citizens for Bengaluru organised the Beku Beda Santhe on 15 October to commemorate the first year anniversary of the Human Chain that kick started the Steel Flyover Beda movement in 2016. The idea of the Santhe was to give the citizens a platform to voice their priorities for the city. 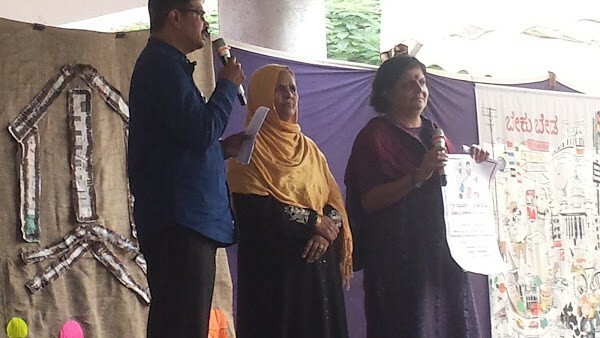 The event had multiple platforms – a main stage which had eminent citizens share space with active citizens to voice their demands; mini stages; a children’s art corner. The main attraction was a 50-feet wall made of recyclable cardboard cartons for people to pin their beku and beda demands. The Santhe kicked off with Justice Santhosh Hegde’s speech about the role reversal for the Constitution which was originally meant as an instrument to keep the elected government in check had instead become a tool to keep the citizens in check. He also pointed out that since the larger steel flyover was stopped, the government had now planned for two smaller versions in the city which suggested of unfavourable intentions. The other distinguished speakers included theatre personality Prakash Belwadi who asked the people to take up more ownership of their city because nobody else could protect it better; Professor Ashish Verma, the mobility expert from Indian Institute of Science who advocated an integrated public transport system; A R ShivaKumar the rain harvesting expert who elucidated on how everybody could implement rain harvesting at their homes and Geetha Menon of the Stree Jagruthi Samithi who brought the voice of arguably most important stake holder of the city – the domestic maid. The Santhe championed the voices of the common men and women of the city too. K Y Venkatesh, a para olympic athelete spoke about the hardships faced by the specially abled people in the city for mobility.NGOs working with children, Jwalamukhi, APSA and Dream a Dream, had their wards talk about the beku bedas of children and the rights of transgenders respectively. The Santhe also hosted a three person changemakers panel, curated by Meera K of citizen matters. Uday Kumar, Aniruddha Dutt and Annu Govind were regular professionals/ student who picked issues plaguing the city and worked on them despite their busy schecules. Uday Kumar documented Veeragallus around the city, Annu Govind who worked solid waste management and Aniruddh who is a student worked on involving the community to clean up Bangalore spoke about their experiences on how to juggle their passion for the city and everyday lives. The mini stages were a hive of activity too, where people with common geographies converged to discuss ideas and also familiarise themselves with other citizens working on issues that were dear to them. Basaveshwarnagar also saw a Resident Welfare Association form at the Santhe itself! The event was also high on art quotient. 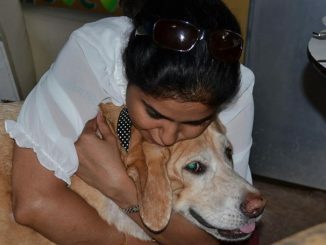 M D Pallavi, Bhoomi Tayi Balaga, Sparsh Trust that opened the Santhe with their Dollu Kunitha kept the energy going. But the surprise element came when members of the Bengali Association sang a kannada song effectively nullifying all aggressive arguments of insider versus outsider which was also discussed at the Santhe. Geetha Menon delivering her speech. The 51-feet Beku Beda wall had miniature red and green paper fans pinned by citizens, to vote on various issues that had been identified – water, garbage, road, traffic, pollution and environment. These votes would be tabulated and consolidated as a report to be presented to the government. As an event meant to start conversations among the citizens, the Santhe seemed to be a success. Many of the citizens who were unaware of their fellow city warriors got a chance to interact and share ideas. 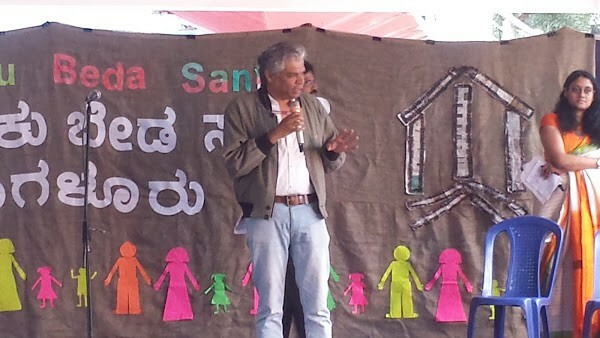 Prakash Belawadi addressing the gathering. “The footpaths of the city are not just not friendly for the senior citizens. I am eighty years old and it is such a hardship for us to walk around the city. – Sri Ramachandran, senior retired police officer. The event was open for all the citizens. The registration for the event was fee. A total number of 602 participants including residents welfare associations, organizations and some students from various schools and Colleges attended the event. Some of the organizations present include United Bengaluru,Citizens’ Action Forum, Greenpeace, Bangalore Political Action Committee, Citizen Matters, Namma Bengaluru Foundation, Potholes Patrike and Stree Jagruti Samiti (SJS),Dream a Dream ,Association for Promoting Social Action,Whitefield Rising,Stree Jagruti Samiti and organizers Citizens for Bengaluru to mention but a few. Citizens for Bengaluru works on improving the quality of life, for all, in the city. The organization wants to create awareness amongst people by organising campaigns and activities that actively involve the public and consulting and leveraging the vast professional and living experience of the city’s citizenry. The episode serves an important lesson for people active in civic space: never give up. Here’s a group that will help home buyers get right guidance on the legalities of home buying and inform them of their rights and duties of builders.